My journey to an organized life started when I read “Getting Organized the Bonnie McCullough Way” in 1987. When I went to re-read it later on, I discovered I had almost subconsciously adopted many of her recommendations. 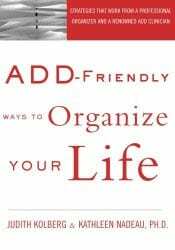 I started my organizing journey by reading Julie Morgenstern’s book Organizing from the Inside Out in 2006. She has updated the book and added a number of other books to the series. I read this book some years ago and recommend it to potential clients dealing with ADHD because I am not an expert in this area. Thanks for sharing the highlights. It is an interesting book to read because it is written in a way that someone with ADHD would find it easy to follow. However I found it difficult to follow. So the content and the format of the book both provided a good learning experience. ADD-Friendly Ways to Organize Your Life is one of my favorites. The first organizing book I read (and there weren’t many available in 1993) was Stephanie Winston’s Getting Organized. I still own it with it’s earmarked pages. 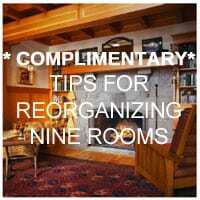 I have Stephanie Winston’s Best Organizing Tips book. I have Stephanie Winston’s Getting Organized too. I probably bought it in the late 1980s. Yes it is an older book, but I really liked it when I was getting started in the Professional Organizing business.